Gosh, how do these guys get gigs? I have been freelancing for a year and am pretty much rolling snake eyes. Are these folks selling gigs to family and friends to get their reviews up? Are they buying their own gigs under fake aliases? Also to get more reviews. IDK. Just seems that my work is better than theirs and to read their description they are woefully inadequate. Posting for a Facebook advertising gig stated he was getting 40 cents a click for ads and thought that was great. Hell, I delete campaigns that do not do better than 15 cents. So I am thinking that the freelance sites are a gimmick with the only people making any real money being the site themselves. I see so many folks that want and need the money they think is theirs. Demanding results. They have gone through dozens of freelancers believing their plan will work if they just find that 1 in a million person. It is all someone else’s fault they have no business….blah blah blah! Well, you will probably be in line for government benefits soon with thinking like that. NOTE: Digital marketing is not something that can be done overnight. 1. build brand awareness through ads and seo. 2. Encourage engagement with content via web content and social posting. 40% of followers should be sharing and liking your posts. You can have the best content, but it has no value if no one sees it. 3. non invasive non salsey Call to action when ready to purchase. How does facebook ad auction work? Interest and relevance. How likely a person is to click on an ad. Facebook then determines the winner and serves the ad. How does Facebook determine the winner? Total Value. Total value does not mean the highest bid wins. Facebook is more concerned with User Value. Advertiser bid. The amount and how an advertiser wants it spent. What is estimated action Rate? Facebook determines how they think your audience will react to your ad based on the optimization you choose and CPM. Via past ad performance and past user interaction. Relevance Score. Facebook states that the relevance score is NOT used directly in the formula. BUT is part of the matrix in determining User Value. The relevance score is a value that Facebook believes the ad to be performing. How the audience is reacting. Positive feedback and negative feedback. Positive being clicks, likes, installs, and conversions. Negative being…well we all do it… I DO NOT WANT TO SEE THIS! On Facebook high relevance means lower cost ads. Cold selling Facebook ads. Wow genius just shoot yourself in the foot why don’t ya’? Why can’t I sell anything? Geez…the products have not sold anything at all via Facebook ads. I have like 35 likes I have generated from running ads. I know what the problem is for me. You cannot sell anything with digital marketing on a consistent basis w/o developing trust. If you are just starting out then you need to have people following your social media. These marketers and ad agencies telling you that they can make you thousands with Facebook ads and other platforms like Google Adwords is a pitch to get your money. Often many potential clients have spent thousands before realizing the agency is doing exactly what was done in-house. Simple fact…COLD SELLING is fantasy for dreamers. I am not going to go overboard on funnels and what the psychology is behind them. But they do represent the very things in life that the majority of citizens are taught. Things like having respect for others. Being honest. Doing what you say you are going to do. I am not a fan of cold selling or high pressure sales. Just go Google sales funnel and you will see many theories on convincing someone why you are the best choice. Looks good in theory I guess. I personally do not appreciate sales funnels as gospel. I can sit in a parking lot and sell 1,000 flowers with just my pickup and a for sale sign on Valentines Day. So you make your own opinions on whether they are just overloading the Internet with garbage content. I see a lot of postings on the freelance sites from people wanting instant results selling that drop shipped junk on the e-commerce website they set up last week. NAH. My services are not available to folks like that. I need 250 page likes. I need an audience to build from. An audience of 250 active Facebookers liking and sharing my page and posts. So if I have 800 followers 250 of them might be beneficial to me. I say the majority of page likes are wasted effort. Because they may like your page and what you do initailly, the majority will never come back or contribute to your page. Much less buy your products or services. What next? Now that I see what is wrong. I think the best thing for me to do is expand my product line to real products I make myself. As eBay, Amazon, Walmart, Shopify and other e-commerce platforms are already saturated with people reselling all of the same stuff. Getting my market share will be tough but maybe I should concentrate on nailing down a Bass Pro Shops contract. Maybe even administer a really large ad account with over $50k a month budget. But I do know that the reality is… I will most likely retail my products to the public for very little net income.I understand that on my freelance side most of my jobs will be $100 gigs for folks just trying to make a dream into income. Book with me on Facebook for your Facebook and Google campaigns. I will listen to you and your problems regarding Digital Marketing and try and help find a solution. 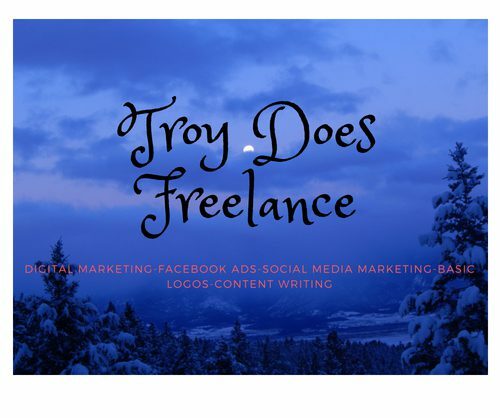 My Freelance Facebook page. My Fiverr gig is up and running. Facebook ad targeting complete set up with options. Getting your Facebook ads to a targeted audience is vital. Number one reason? Cost. Broad campaigns do not work. You are better off wasting time hash tagging like a #teenybooper on twitter.